Infant Formula Milk Stage 1 - 600g. HiPP First Infant Formula 1 is a nutritionally complete, whey based, gentle infant milk, ehich is suitable from birth onwards if baby is not being breastfed or to complement breastfeeding HiPP supply your baby with everything it needs to complementary feeding for healthy growth. HiPP First Infsnt formula 1 is specially formulated using only the finest organic milk and contains Omega 3 & 6 LCPs (DHA && AA) and PREBIOTIK oligosaccharides (GOS), as well as all the important vitamins, minerals and other nutrients (required by law) that babies need to grow string and healthy. Instant preparation, ready in minutes. Just add boiled water and shake well. 600g / 21.16 oz - makes about 150 oz of prepared formula. No added soya, wheat, nuts, egg nor celery/celeriac. Ideal for feeding in a bottle. Combining the benefits of nature with what they have learnt from breast milk, their gentle organic infant milk is specially formulated using only the finest organic milk and provides the nutrients babies need to grow strong and healthy when they are not being breastfed. All the organic ingredients used in HiPP Formulas are tested at every stage of production for purity and to insure no unwanted chemicals are present. HiPP Organic Formula is Certified Organic, which means it is free from GMO (genetically modified organisms) and is very safe for our children. These include making sure there are no pesticides used on the farms where the cows graze: babies are known to be more susceptible to the effects of pesticide residues so choosing an organic diet for babies is very important. Organic foods are produced much more sustainably; and are more sympathetic to the environment, animal welfare and the worlds resources. HiPP Organic Formula has Prebiotics. Also found in breast milk, prebiotics are indigestible carbohydrates that stimulate growth of specific bacteria that improve babies health. HiPP Organic Formula has Omega 3 & 6 LCPs (DHA & AA). Also found in breast milk, these long chain polyunsaturated fatty acids help babies with brain and eye development. Organic skimmed milk, organic whey product, organic vegetable oils [organic palm oil, organic rapeseed oil, organic sunflower oil], organic starch, Galacto-Oligosaccharides (obtained from lactose), calcium carbonate, long-chain polyunsaturated fatty acids (fish oil, vegetable oil from mortierella alpina), potassium chloride, l-tyrosine, vitamin C, l-tryptophan, iron sulfate, zinc sulfate, vitamin E, stabilizer lactic acid, natural Lactic acid culture [Hereditum® Lactobacillus]. Lactobacillus Fermentum CECT 5716, niacin, pantothenic acid, cuplex, Vitamin A, Vitamin B1, Vitamin B6, manganese sulfate, potassium iodate, Vitamin B2, sodium sulfate, folic acid, Vitamin K, biotin, Vitamin D, Vitamin B12, L-Tryptophan, Lactic acid. After the packet is open, use in the next 2 weeks. Storing formula in a glass or Stainless steel container is recommended. Discard prepared unconsumed formula after one hour. Please keep away from heat and humidity. This baby formula is not expired the expiration date is 12/2019. 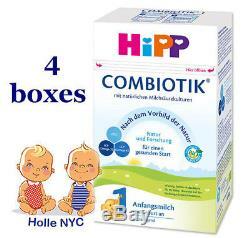 The item "HiPP BIO Combiotic Stage 1 Organic First Infant Milk FREE SHIPPING 4 Boxes 12/19" is in sale since Monday, January 25, 2016. This item is in the category "Baby\Feeding\Bottle Feeding\Formula". The seller is "mtauction" and is located in New York, New York.